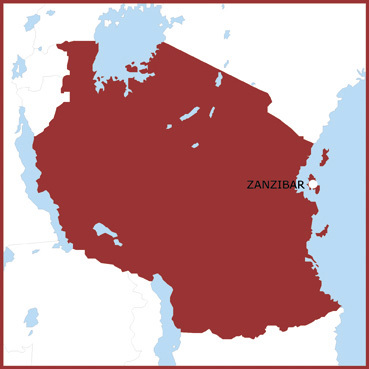 The territory of Zanzibar is an archipelago located in the Indian Ocean, off the coast of eastern Tanzania, a few degrees south of the equator. It consists of two main islands, Unguja (or simply "Island of Zanzibar") to the south and 50 kms. north lies Pemba Island. Within the surrounding seas are over forty islands, all considerably smaller, some of which are uninhabited. These islands and the mainland of Tanzania are separated by the Zanzibar Channel of about 40km in width. The islands are generally hilly, with little relief. They once were covered by rainforest but over the centuries have been almost completely deforested to create farmland. Tracts of original forest of significant size are found only in the three main protected natural areas: the Jozani Forest in Unguja and forests Ngezi and Msitu Mkuu on Pemba Island. Being close to the equator the equatorial climate of the archipelago is distinctly tropical, with high temperatures all year and two rainy seasons. The Long Rains run from March to June and Short Rains from late October to December/early January. The rain tends to be short and sharp following by sparkling sunlight. The surrounding seas still habour some amazing corral gardens and to the north lies the deeply shelving Pemba Channel, also known as the ‘Serengeti of the Seas’ because the wide range of depths offers a large variety of fish to be seen, from gigantic manta rays to the small Clown fish.